Phenomenal Fishing, Live Music, and More! Fall at the beach is a magical time. The intense heat and busy summer season vanish and make way for relaxing strolls on the sand or bike rides along the coastal highway. The earth’s tilt allows sunsets to fall just right over the Gulf and cast dazzling hues of orange, pink, and purple across the sky. If you’re staying in one of our many affordable vacation rental homes, motels, inns, or campgrounds, the best views are just steps away. Our locals cherish the fall months and hope you will too. Stop by to visit shops full of personality and fun finds—Frost Pottery Garden and Gift Shop, the Grove, About Beach, the Shell Shack, and many others—where you can browse while chatting with friendly local owners and operators who might just give you the inside scoop on the best spots to plant your beach chair or reel in the “big one” on a day of fishing. Seasoned charter captains at the Mexico Beach Marina are here to help with deep-sea expeditions, dolphin tours, sightseeing, and fishing licenses. Craving the sounds of a steel drum band or a country music twang? With weekly sunset concerts, music festivals, and more, Mexico Beach loves sharing the sounds of its local musicians just as much as sharing the sound of waves against the sand. Have you started planning your fall break at the beach yet? 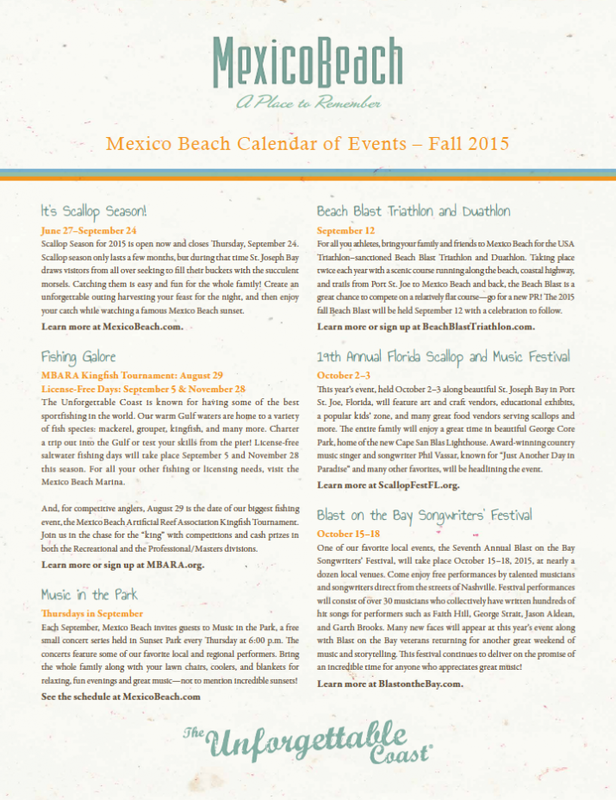 Check your schedule because Mexico Beach is holding some great events this season to make it even better! See our attached calendar for all the fun in the sun and surf. 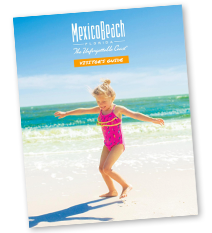 Plan your visit to The Unforgettable Coast or request a free Visitor’s Guide today at MexicoBeach.com.